Barrie Mahoney worked as a teacher and headteacher in the south west of England, and quickly fell in love with the area. Later, he became a school inspector in England and Wales, and had the privilege of visiting many different schools. Barrie’s work in schools enabled him to witness many amusing incidents, and to listen to children’s views about life and the world in general. A new life and career as a reporter in Spain’s Costa Blanca, led Barrie and his partner to launching and editing an English language newspaper in the Canary Islands, where he now lives enjoying life in the sun as a columnist, author and broadcaster. Barrie’s books for expats and travellers include: Letters from the Atlantic, Expat Survival, Living the Dream and Message in a Bottle. His novels include Journeys and Jigsaws and Threads and Threats. All are available on Amazon, Kindle, iBooks and from all good bookshops. Barrie's websites include Canary Islander and the site below. As all true Brits know, it is impossible to get a decent cup of tea abroad. Many have tried over the years, and failed miserably. 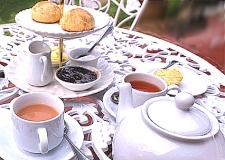 Tea is the true Brit’s favorite beverage, closely followed by a large gin and tonic, and is one of the reasons that expat life fails miserably for some people. No one but a true Brit really understands all the fuss over a “Nice Cup of Tea”: It is the stuff that unites as well as steadies the nerves of the nation and, according, to Winston Churchill, wins wars against all the odds. When fate decides to deal one of its more cruel blows, the true Brit rushes for the teapot, sits down and reflects over a “Nice Cup of Tea”. Indeed, it is often said that tea is the stuff that runs through the veins of the true Brit. Wise Brits on holiday always travel with a kettle, albeit of the small suitcase variety. Many even travel with their own packets of tea, because they are convinced that the stuff for sale in continental supermarkets isn’t the real thing, but a rather nasty ‘look a like’ variety designed to appease the discerning British holidaymaker. Asking for a cup of tea in most bars or hotels, usually guarantees a shrug followed by the arrival of a nasty stainless steel teapot filled with lukewarm water, together with a fusty teabag containing mouse droppings. Sadly, even one’s own kettle and a supply of tea, albeit as teabags, produces a really nasty cup of tea in the hotel bedroom. This really is the stuff to make the discerning British tea drinker pack up and go home, determined to holiday in Brighton the following year. So, what about the British expat? How do they survive? Well, not very well, by all accounts. I firmly believe that this is the reason why so many expats wear a scowl rather than a smile in the sunshine. Of course, if asked, they blame the European Union for not being able to get a “Nice Cup of Tea”, but then again, they blame the EU for most things anyway. Until recently, some of our friends always asked us to bring packets of Yorkshire Tea back for them whenever we visited the UK. Despite considerable efforts over several years, including the installation of an expensive water filtration and water softening system, they could cope no longer and finally fled back to the UK, teapot in hand, to resume their lives and to delight once again in enjoying “A Nice Cup of Tea”. Of course, the real problem is the water. Foreign water just isn’t like the ‘real’ water from Britain. After all, it has been pumped with chemicals, often desalinated and usually unfit to drink, isn’t it? Sadly, most expats are blind to all the impurities in the water that they drink in the UK, and remain obstinate to the facts that water standards in mainland Europe are often much higher than in the UK. How about bottled water? That is the same stuff poured into bottles and sold at a ridiculously high price, isn’t it? Most expats take the view that whilst expensive bottled French water with a posh name maybe all right to swill your dentures in at night, it is certainly not the stuff to pour over a precious teabag. The true expat quickly accepts the fact that “A Nice Cup of Tea” is impossible to find once one passes the White Cliffs of Dover. It is best to accept ones fate and realize that a lifetime of drinking decent coffee in continental bars and restaurants looms, and is far preferable to drinking an overpriced soup bowl of the foul stuff served in most of the new chains of coffee bars that seem to have sprung up overnight across the UK. All expats develop their own coping strategies. Personally, I still get pangs for a “Nice Cup of Tea” at around 4:00 pm each afternoon. I have partly resolved the issue by now only drinking green tea, with no milk or sugar, which I agree is an acquired taste. I prefer to use a china teapot, cup and saucer, never a mug, and if served with a nice fresh scone and jam, so much the better. Being an expat in all this sunshine really isn’t easy, but I am getting used to it. Check out other similar posts in the Humor, Retirement locations, Travel category.